Yesterday we went to a 5k run in the morning and a chess tournament in the afternoon. There were new experiences all around. The run was recommended by Esme’s cross country coach. It was at a nearby park. The two loop course was approximately two-thirds through the woods on a trail and one third on an asphalt path. The whole event was enveloped in the third consecutive day of rain. As a result, organizers had low turnout. In fact, our tribe was the whole of the youth female age group. It was a mass start and the first half a mile is quite hilly. Esme bolted off the line and established herself somewhere in the mix of the people running in places 6-10. Josephine chased after her sister (with Papa lagging a step behind) and after about three minutes was extremely uncomfortable. “I have a cramp Papa” became the refrain. It was hard. She was upset to watch the field — now broken into distinct groups — pass her. Her cramp was certainly real and quite uncomfortable. She was embarrassed and angry and frustrated. She is seven. We walked and occasionally ran ten to 15 meters at a time for nearly 20 minutes. Finally, as we neared the end of the first loop, and as I feared that her older sister would lap her, we broke out of the trees and only had 30 meters to go. While insisting to me that she wanted to do both loops, as soon as she saw her Mama, Josephine conceded that one loop was enough for the day. About two minutes later her sister came through the same clearing to finish in 24:53. A minute or two later, I had reset my watch and took off to run the course by myself. I managed to finish in 21:31 as they were announcing the winners of the mens division. It was hard. There was no field and no one to help with pacing. The trail had several twisting turns which require an acceleration after braking. I was burning up from my legs to my lungs. I inadvertently stepped in a creek and nearly tripped as I skimmed over a log in the path. After lunch, we packed up and went to the first chess tournament of the school year. Desmond and Josephine wanted to play while Esme and Tobias entertained themselves (for the most part.) After they each played four matches — in the K-1 beginner group — Desmond had three wins and one loss while Josephine had a pair of each. She took it all in stride and though she didn’t think it fair to have to play the overall winner for her last match, I think she surprised herself. I hope it translates to a little bit more confidence for her with chess, as well as with other activities where she isn’t “the best” already. Desmond handled his loss — in the third match — with surprising grace and maturity. There were no tears or tantrums. He didn’t want to go home. Instead of bouncing around the waiting area for the next match, he sat quietly with me and read. I was so very proud of him. Later, after the other kids had loaded into the van and his second place trophy was safely tucked away, I pulled him aside and told him so. He remarked, “It was hard Papa. I don’t want the other kids to make fun of me for losing.” I told him that losing with grace often gives you the chance to learn from the experience. He beamed, “I did, Papa, I did. I started the next match differently and won!” In his way, he got the point. Tobias wants to compete as well. Here he takes a lesson from the 2012 Virginia Chess Champion, Coach Justin. 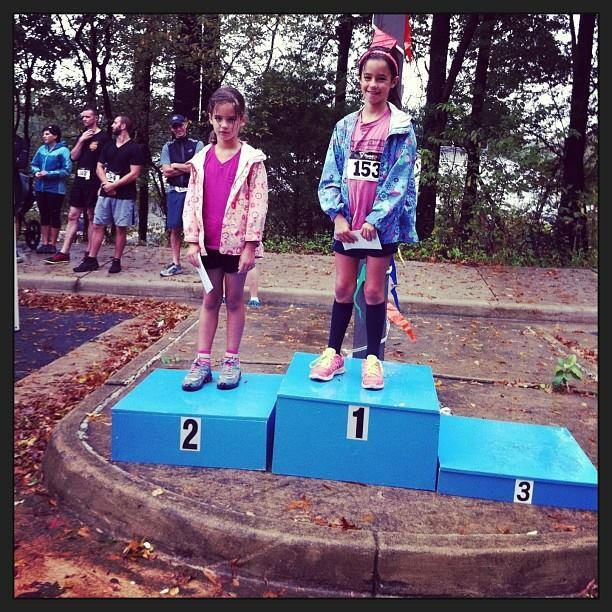 On the run course, between the wails and tears, I thanked Josephine for the courage to try something new. I told her how important that was and that it made me proud. Later in the car, unprompted by me, Dana made nearly an identical comment. Trying new things was a big success for the day. I like to think that right there, wet and muddy and a bit stinky, we stood on the parenting podium for the day. We won the parenting trophy — for Saturday. Today is proving to be a whole ‘nother ballgame. But that is okay, I wouldn’t have it any other way. The All Damico-Lassman Podium! The girls got a taste of victory. Esme finished with the 11 fastest time overall and fastest time for a female while the two of them swept the youth female division.